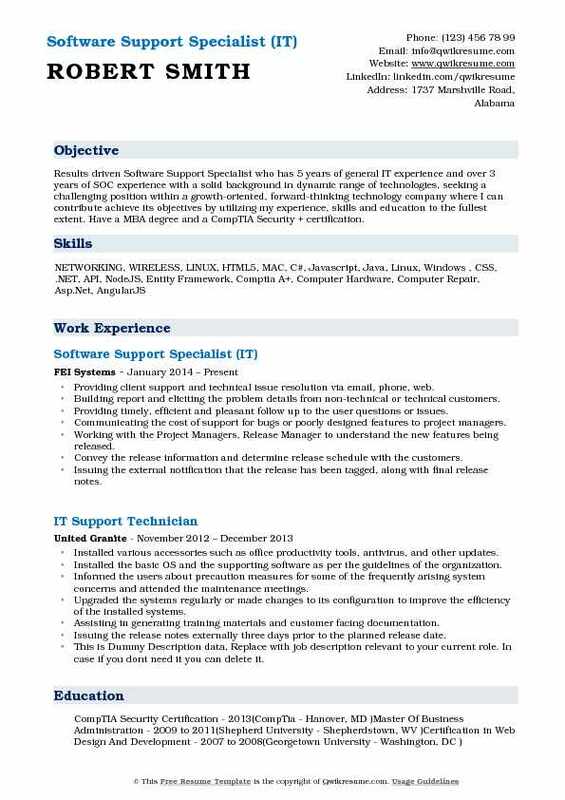 A Software Support Specialist’s job description primarily includes providing technical support and advising IT users. Resolving any technical problems faced by a customer is one of the key roles of Software Support personnel. 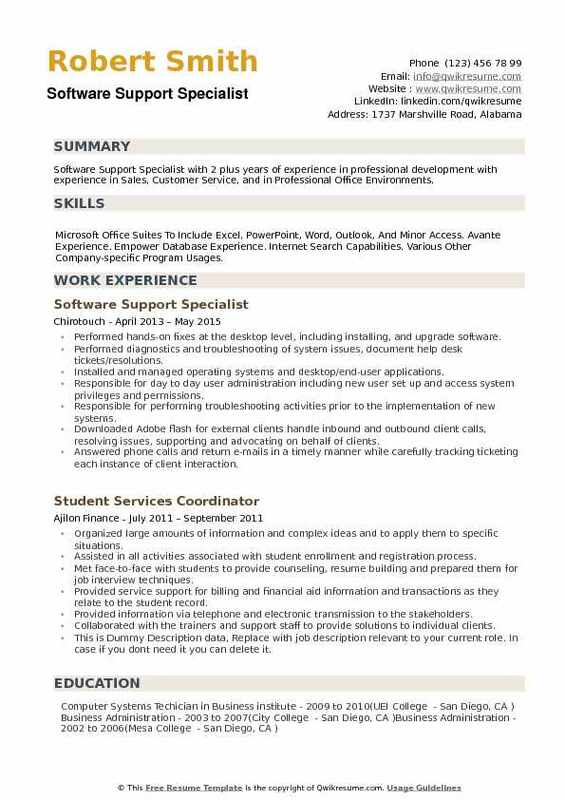 The job responsibilities that are commonly present on the Software Support Specialist Resume include – logging as well as processing support calls, installing and configuring software for customers as well inside the organization, responding to breakdowns, maintaining records of software licenses, and responding to and resolving any software related issues. Common skills that are expected from a good Software Support Specialist are basic knowledge in installation and configuration of software, up-to-date knowledge of IT software trends, a knack for communication over various communication methods like email, phone, social media, etc. A Bachelor’s Degree or Diploma in Computer Science and Engineering is the educational qualification needed for Software Support. 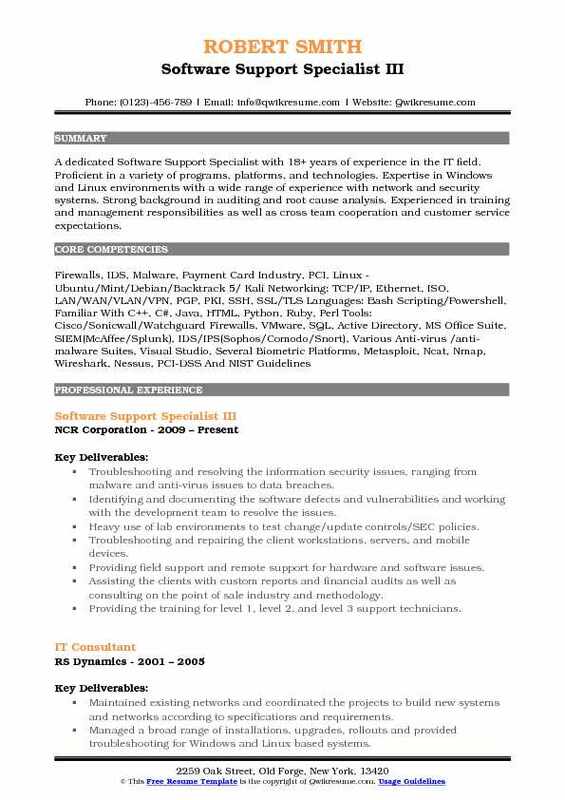 Summary : Dedicated Software Support Specialist I with 11 years of experience, motivated to maintain customer satisfaction and contribute to the company success. Proven ability to establish rapport with clients and exceed client expectations. Reliable and driven with strong time management and prioritization abilities. Attending the trade shows as a technical liaison able to offer both technical and operational insight for future sales leads. Cross-training the salesforce on product features of SAAS solution/product line. Assisting in the design discussions on communication protocols and future wireless communications technologies. Gathering the customer requirements for new features/functions on SAAS solution to better fit the customers' needs. Performing analysis suggested improvements to the SAAS solution and validating the business needs of such improvements. Identifying, analyzing and presenting to stakeholders the improvements to the SAAS solution product line and expanding that product line. Facilitating the problem-solving meetings across multiple departments to ascertain corrective actions and how they are to be implemented. Assisting the QA and helpdesk in identifying, analyzing and resolving issues with new and existing features in the SAAS solution and participate in root cause analysis. Assisting the development of group brainstorming and discussion of software structure, feature sets, and new technologies for saas solution. Acting as a liaison between the SAAS development, Hardware Engineering, Operations, Sales and Manufacturing to ensure the smooth communication and execution during system deployments and new market introductions. 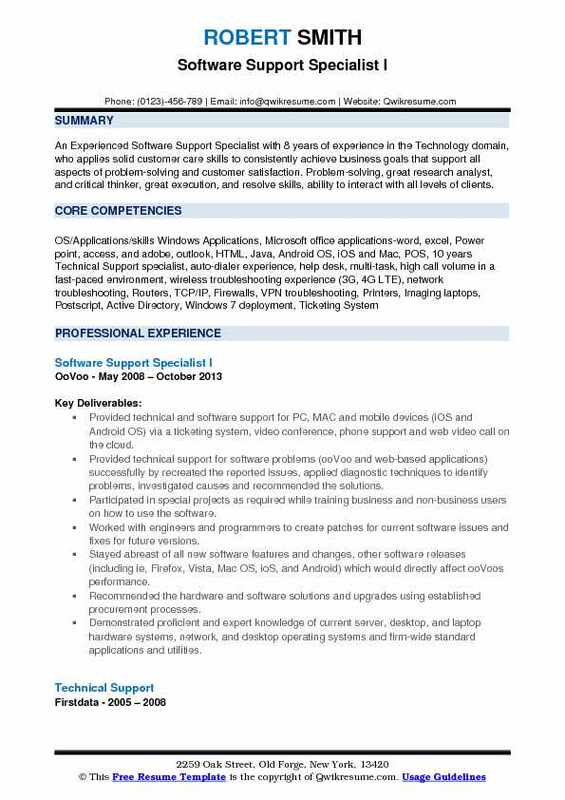 Summary : An Experienced Software Support Specialist with 8 years of experience in the Technology domain, who applies solid customer care skills to consistently achieve business goals that support all aspects of problem-solving and customer satisfaction. Problem-solving, great research analyst, and critical thinker, great execution, and resolve skills, ability to interact with all levels of clients. Provided technical and software support for PC, MAC and mobile devices (iOS and Android OS) via a ticketing system, video conference, phone support and web video call on the cloud. Provided technical support for software problems (ooVoo and web-based applications) successfully by recreated the reported issues, applied diagnostic techniques to identify problems, investigated causes and recommended the solutions. Participated in special projects as required while training business and non-business users on how to use the software. Worked with engineers and programmers to create patches for current software issues and fixes for future versions. Stayed abreast of all new software features and changes, other software releases (including ie, Firefox, Vista, Mac OS, ioS, and Android) which would directly affect ooVoos performance. Recommended the hardware and software solutions and upgrades using established procurement processes. Demonstrated proficient and expert knowledge of current server, desktop, and laptop hardware systems, network, and desktop operating systems and firm-wide standard applications and utilities. 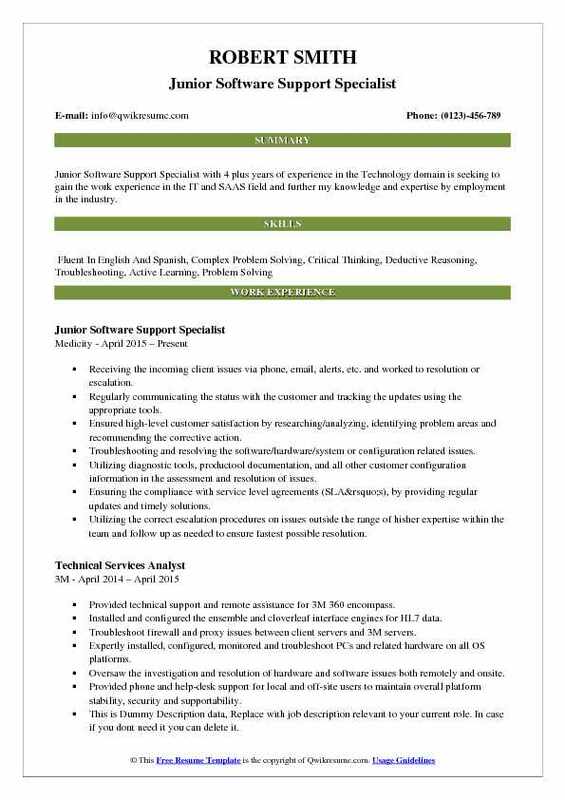 Objective : Junior Software Support Specialist with 4 plus years of experience in the Technology domain is seeking to gain the work experience in the IT and SAAS field and further my knowledge and expertise by employment in the industry. Receiving the incoming client issues via phone, email, alerts, etc. and worked to resolution or escalation. Regularly communicating the status with the customer and tracking the updates using the appropriate tools. Ensured high-level customer satisfaction by researching/analyzing, identifying problem areas and recommending the corrective action. Troubleshooting and resolving the software/hardware/system or configuration related issues. Utilizing diagnostic tools, product	ool documentation, and all other customer configuration information in the assessment and resolution of issues. Ensuring the compliance with service level agreements (SLA’s), by providing regular updates and timely solutions. Utilizing the correct escalation procedures on issues outside the range of hisher expertise within the team and follow up as needed to ensure fastest possible resolution. Documenting the solutions by effectively utilizing support tools to document problems and propagate solutions to faq’s, knowledge bases, customers, service providers, and co-workers. Maintaining and updating the existing documentation, ensuring accuracy and relevance. Staying current on MEdicity/Aetna products/tools, current support policies, and methods of support delivery by way of self-study and attending training sessions. Meeting the ticket closure targets both individual and team to satisfy the performance goals. Working with other team members to improve first call resolution by sharing knowledge. Identifying the recurring issues and working with the product/tool development teams to identify solutions. 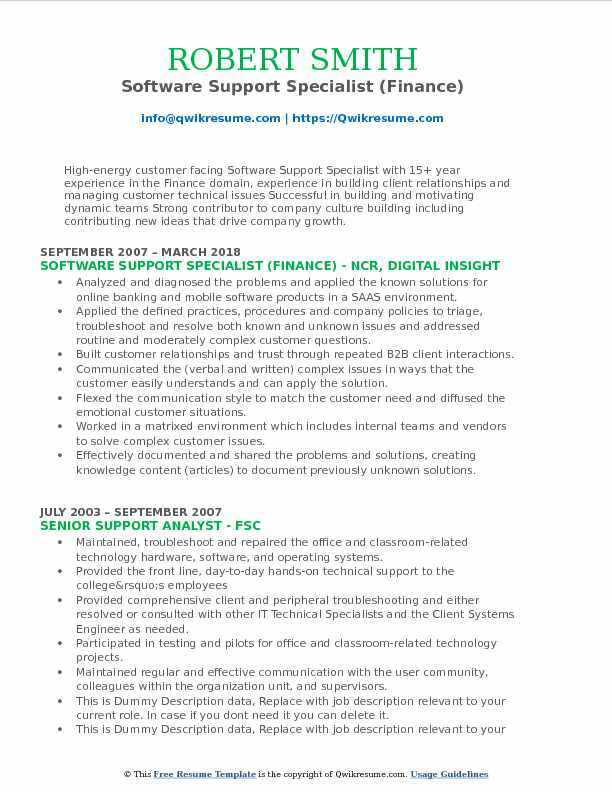 Summary : A self-motivated, problem- solving, detail- oriented, Senior Software Support Specialist with 8 years of experience, with excellent educational and customer service skills. I have the ability to handle multiple projects, work on teams and tasks simultaneously, displaying strong communication skills while achieving and exceeding the needs of the organization. I am able to work independently and in a fast work place environment. Providing email and telephone-based technical support to over 25 clients daily. Helping the clients use our CheckFree website or troubleshooting any issues with the site. Installing MS SQL on clients computer for software use, and installing software on clients computers. Documenting the updates and closing of all support issues in trouble ticket-tracking system in accordance with department procedures and customer service level agreement. Collaborating with other support teams and vendor product teams as required to resolve requests/issues in a timely manner and ensuring the proper documentation, notification, escalation, tracking and follow up of all incidents. Testing any new enhancements or bug fixes that are part of new software release. Diagnosing, troubleshooting, repairing and debugging large and complex application systems. Reporting design, reliability, and maintenance problems or bugs to the Engineering, QA, and Product Management teams. Working closely with the developers to define, evaluate and troubleshoot software functionality. Developing a strong knowledge on current and emerging software solutions and third-party software and hardware products. Summary : Software Support Specialist II with 14 years of experience in the Technology domain, skilled at project implementation and management with exceptional customer service. Possess strong project management and implementation skills, systems thinking and team building. Team player with the ability to supervise others and can also work well independently. Adept at system support, documentation, and training. Took the role of Frontline Support Rep working with different IT groups from client organizations utilizing the AXS-One proprietary enterprise solutions for email storage management, archiving and legal e-discovery in compliance with industry regulations. Provided support to the professional services teams doing the implementations. Worked closely with R&D team on issues to allow efficient resolution of high priority defects. Helped improve the product by collecting client enhancement requests and providing to product management. Worked on quality assurance testing of new features and defect/bug fixes. Worked with clients technical or legal teams in formatting and translating the search criteria provided by lawyers to what the software needs to provide the most accurate results in their e-discovery requests. Consistently recognized for technical troubleshooting skills used to rapidly and cost-effectively resolve challenging technical issues. Trained with other employees on "high performance" work teams and "effective communication". Maintained a high standard of customer retention and obtain new customers while saving the company's finances. 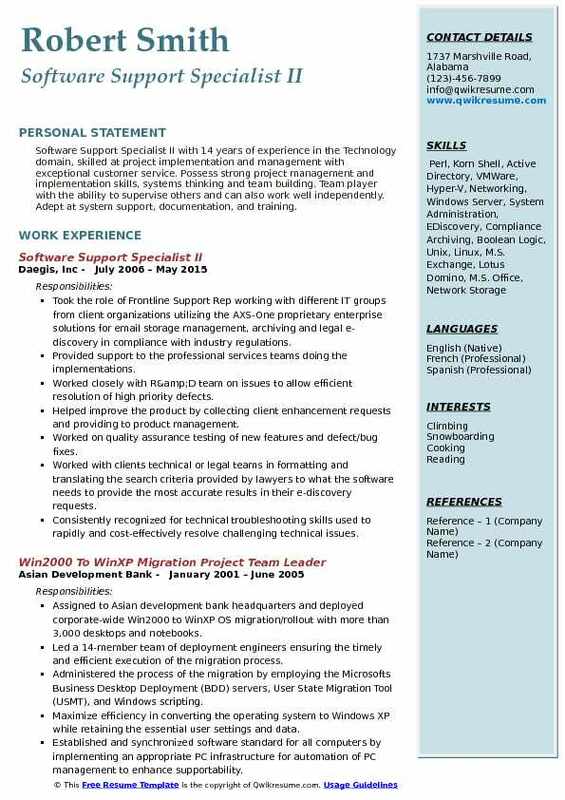 Headline : Results driven Software Support Specialist who has 5 years of general IT experience and over 3 years of SOC experience with a solid background in dynamic range of technologies, seeking a challenging position within a growth-oriented, forward-thinking technology company where I can contribute achieve its objectives by utilizing my experience, skills and education to the fullest extent. Have a MBA degree and a CompTIA Security + certification. Providing client support and technical issue resolution via email, phone, web. Building report and eliciting the problem details from non-technical or technical customers. Providing timely, efficient and pleasant follow up to the user questions or issues. Communicating the cost of support for bugs or poorly designed features to project managers. Working with the Project Managers, Release Manager to understand the new features being released. Convey the release information and determine release schedule with the customers. Issuing the external notification that the release has been tagged, along with final release notes. Summary : High-energy customer facing Software Support Specialist with 15+ year experience in the Finance domain, experience in building client relationships and managing customer technical issues Successful in building and motivating dynamic teams Strong contributor to company culture building including contributing new ideas that drive company growth. Analyzed and diagnosed the problems and applied the known solutions for online banking and mobile software products in a SAAS environment. Applied the defined practices, procedures and company policies to triage, troubleshoot and resolve both known and unknown issues and addressed routine and moderately complex customer questions. Built customer relationships and trust through repeated B2B client interactions. Communicated the (verbal and written) complex issues in ways that the customer easily understands and can apply the solution. Flexed the communication style to match the customer need and diffused the emotional customer situations. Worked in a matrixed environment which includes internal teams and vendors to solve complex customer issues. Effectively documented and shared the problems and solutions, creating knowledge content (articles) to document previously unknown solutions. Delivered the process improvement via lean methodologies and innovation practices. Managed a backlog of customer projects and tasks while fielding new incoming work while delivering high customer delight. Pro-actively contacted the clients with suggestions for their business or to work towards any possible issues that may arise. 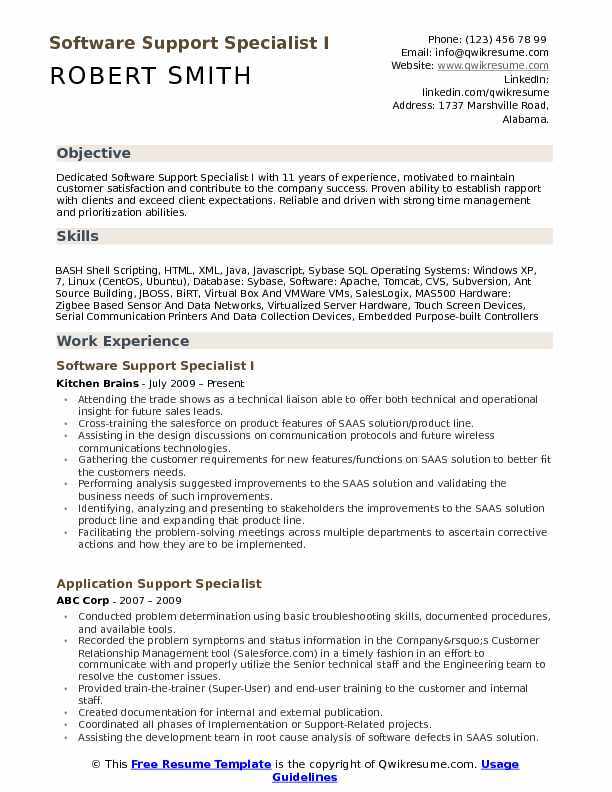 Summary : A dedicated Software Support Specialist with 18+ years of experience in the IT field. Proficient in a variety of programs, platforms, and technologies. Expertise in Windows and Linux environments with a wide range of experience with network and security systems. Strong background in auditing and root cause analysis. Experienced in training and management responsibilities as well as cross team cooperation and customer service expectations. Troubleshooting and resolving the information security issues, ranging from malware and anti-virus issues to data breaches. Identifying and documenting the software defects and vulnerabilities and working with the development team to resolve the issues. Heavy use of lab environments to test change/update controls/SEC policies. Troubleshooting and repairing the client workstations, servers, and mobile devices. Providing field support and remote support for hardware and software issues. Assisting the clients with custom reports and financial audits as well as consulting on the point of sale industry and methodology. Providing the training for level 1, level 2, and level 3 support technicians. Consulting with the software development team to isolate and correct defects as well as software enhancement requests. Assisting with the business continuity programs and disaster recovery operations. Gathering the business process requirements and translating them into the functional workflows as well as training documents. 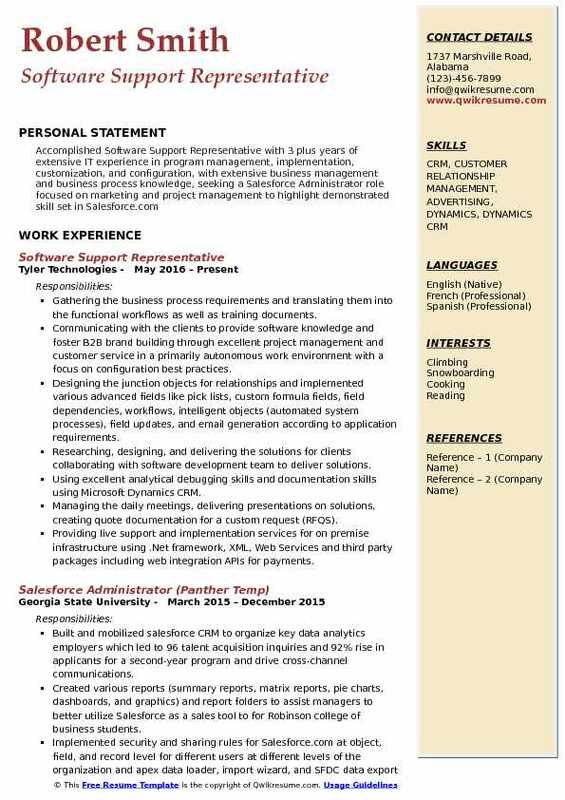 Communicating with the clients to provide software knowledge and foster B2B brand building through excellent project management and customer service in a primarily autonomous work environment with a focus on configuration best practices. Designing the junction objects for relationships and implemented various advanced fields like pick lists, custom formula fields, field dependencies, workflows, intelligent objects (automated system processes), field updates, and email generation according to application requirements. Researching, designing, and delivering the solutions for clients collaborating with software development team to deliver solutions. Using excellent analytical debugging skills and documentation skills using Microsoft Dynamics CRM. Managing the daily meetings, delivering presentations on solutions, creating quote documentation for a custom request (RFQS). Providing live support and implementation services for on premise infrastructure using .Net framework, XML, Web Services and third party packages including web integration APIs for payments. Creating workflows to record system processes, maintaining the server content, supporting the cloud based mobile apps. Writing queries, extracting data sets using SQL/Microsoft Excel, executing the stored procedures and triggers. Possessing a comprehensive understanding of CRM business processes like case management and campaign management. 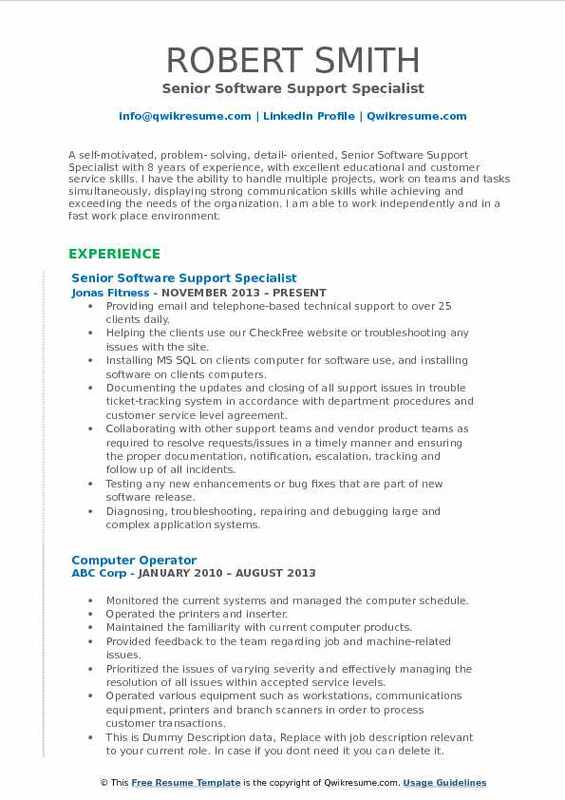 Objective : Software Support Specialist with 2 plus years of experience in professional development with experience in Sales, Customer Service, and in Professional Office Environments. Skills : Microsoft Office Suites To Include Excel, PowerPoint, Word, Outlook, And Minor Access. Avante Experience. Empower Database Experience. Internet Search Capabilities. Various Other Company-specific Program Usages. Performed hands-on fixes at the desktop level, including installing, and upgrade software. Performed diagnostics and troubleshooting of system issues, document help desk tickets/resolutions. Installed and managed operating systems and desktop/end-user applications. Responsible for day to day user administration including new user set up and access system privileges and permissions. Responsible for performing troubleshooting activities prior to the implementation of new systems. Downloaded Adobe flash for external clients handle inbound and outbound client calls, resolving issues, supporting and advocating on behalf of clients. Answered phone calls and return e-mails in a timely manner while carefully tracking ticketing each instance of client interaction. Supported new and existing users through remote desktop on-line connection for technical troubleshooting solutions.